We drove from the Amalfi Coast to Matera and back in a rental car. 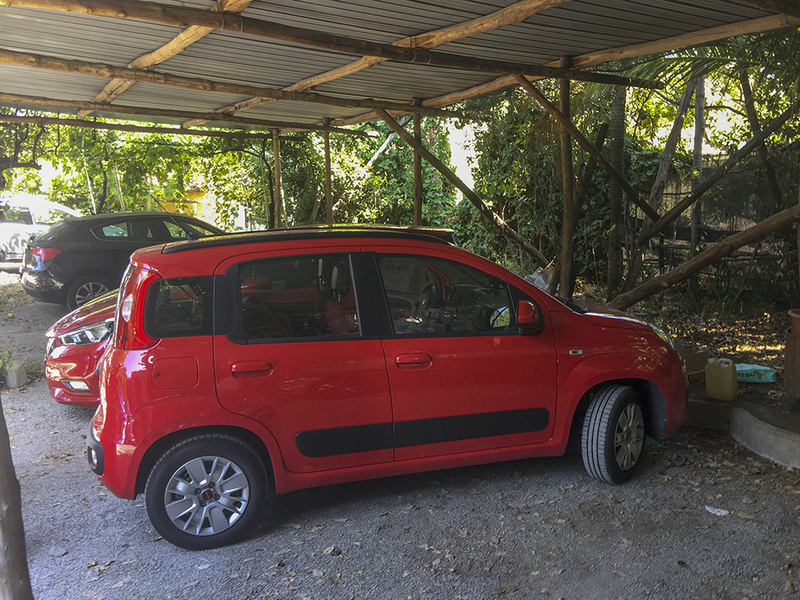 We picked the smallest and cheapest class of car Avis offered so it came as no surprise when we were presented with a bright red Fiat Panda at the rental car office in Sorrento. The gentleman from Avis joked with us that it was a “red Ferrari” as he helped us shoe-horn our two large suitcases and various other bags into the car. But our little Ferrari did us proud on the roads to and from Matera – far surpassing the Ford Focus we had earlier in the trip in Chianti – for both power and comfort. It was only when you saw other Panda’s on the road that you realised you were effectively driving an oversized roller skate. The Fiat was full of useful and thoughtful features to make the trip easier. For example, it came with a holder for a phone on the dashboard which made it easy to follow the GPS directions to Matera and back to Sorrento. Three days later we returned the car intact to Avis in Sorrento – to what must be the most attractive rental car depot in the world.